The atmosphere is getting hotter and hotter in Hong Kong as the World Cup qualifiers match of Hong Kong against China comes close. 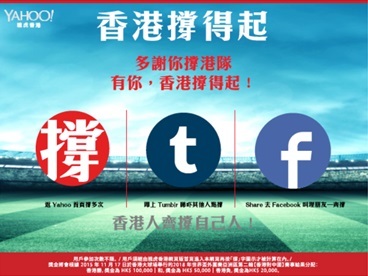 Yahoo Hong Kong announces to launch the “We are Hong Kong” online campaign, calling on Hongkongers to support the Hong Kong Football Representative Team. From today to 30 September, netizens can click “Support” on Yahoo’s “We are Hong Kong” website. When the number of “Support” clicks reaches one million, the search donating up to HK$100,000 to the Hong Kong Football Representative Team based on the team’s home match results against China on 17 November. Yahoo will give HK$100,000 to the team to commend their superb performance if they win the match, or HK$80,000 if the results are a tie, or HK$60,000 if the team loses the match. There is no restriction on the number of times users can participate. They can go back to Yahoo’s homepage and repeat the process, or visit Tumblr to know how the local fans support local football. Meanwhile, Hong Kong football players Wai-ho Chan and Kin-fung Cheung call for citywide support for the “We are Hong Kong” campaign. “We are happy to cooperate with Yahoo Hong Kong in organizing the ‘We are Hong Kong’ campaign, which encourages the cohesive support of all Hongkongers for the Hong Kong Football Representative Team. This is the greatest motivation for us to win a match.” said Mark Sutcliffe, CEO of the Hong Kong Football Association (HKFA). The home match against China will take place on 17 November. Malaysia Tourism Promotion Board has partnered with Fox International Channels (FIC), to produce an eco-travel documentary present..
"Tech is a great enabler, but we still need people to understand it, plan it holistically and integrate it across the channels to .. While brands like RedBull send men to the edge of space, local energy brand Booster C attempts to connect with the Filipino worker..